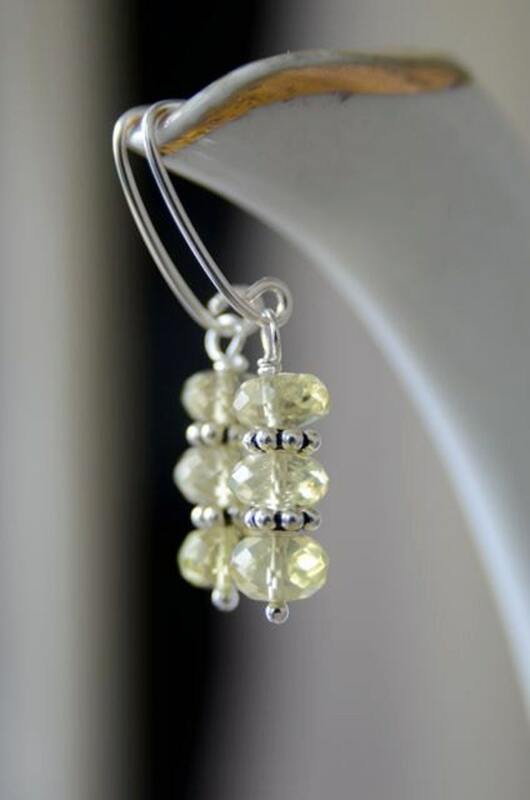 These beautiful earrings are made with six 7X5mm faceted lemon quartz...it is such a lovely pale yellow. I do not work with a lot of yellow...not sure why, because these stones are absolutely beautiful! They are a very happy pair of earrings...perfect for springtime! All metal used on these earrings is Sterling silver. These earrings hang just under 1.5 inches (3.8cm) long from top of the ear wire to the bottom. Ocean Jasper Earrings Crystal Earrings "Clair de Lune Collection"
Pearl Earrings Ocean Jasper Earrings Grey Earrings "Clair de Lune Collection"
Blue Earrings Chalcedony Earrings Silver Earrings Semi Precious Gemstone "Simplicity"
Ocean Jasper Earrings Lavender Earrings Blue Earrings Crystal Earrings "Clair de Lune Collection"